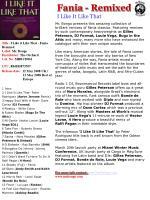 Mr. Bongo presents this amazing collection of brilliant remixes of Fania classics. Featuring remixes by such contemporary heavyweights as Gilles Peterson, DJ Format, Louie Vega, Bugz in the Attic and many, many more who have enhanced the catalogue with their own unique sounds. Like many American stories, the tale of Fania comes from the boroughs and inner city barrios of New York City. 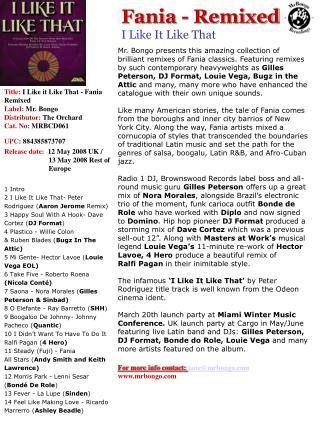 Along the way, Fania artists mixed a cornucopia of styles that transcended the boundaries of traditional Latin music and set the path for the genres of salsa, boogalu, Latin R&B, and Afro-Cuban jazz. Ralfi Pagan in their inimitable style. The infamous ‘I Like It Like That’ by Peter Rodriguez title track is well known from the Odeon cinema ident. 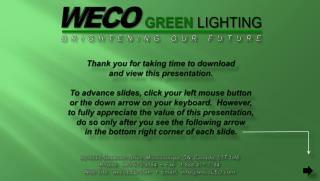 March 20th launch party at Miami Winter Music Conference. 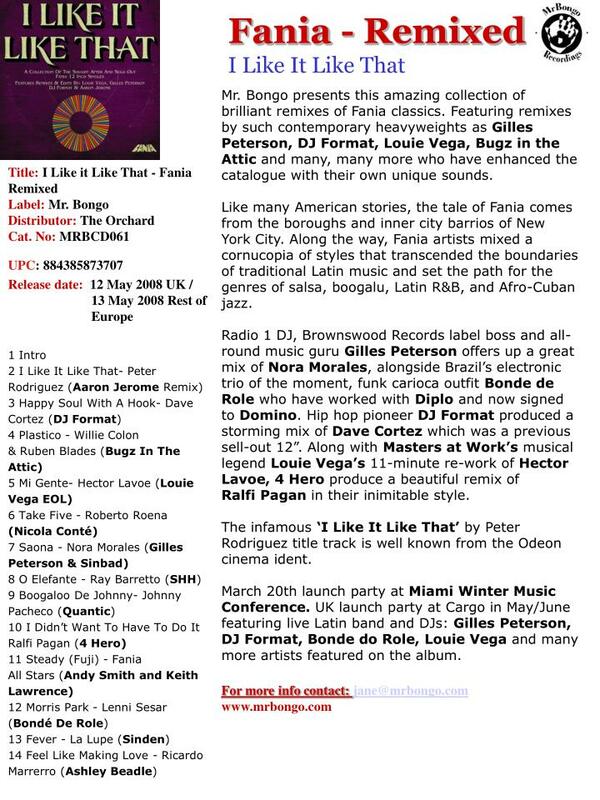 UK launch party at Cargo in May/June featuring live Latin band and DJs: Gilles Peterson, DJ Format, Bonde do Role, Louie Vega and many more artists featured on the album.